Should I Get an Automation System for My Pool? I've lost count of the times I've addressed my parents' Amazon Echo with "Hey Google." There are just so many virtual assistants, it's hard to keep them all straight. Alexa, Siri, Google Home/Assistant, and Cortana (wait, who?)... If I can barely remember which one I'm addressing, I certainly can't keep track of all the things they automate or simplify for us. Here at River Pools, whether we're manufacturing fiberglass pools, installing them, or educating you about every aspect of all three pool types—we aim to make your pool life easier. And that includes telling you about pool options that do that for you. Should I get a pool automation system? Automation systems let you maintain your pool all in one place, from a distance. They make your pool more efficient and make the most difference when you have complex or spread-out pool equipment. Pool automation systems can be complicated to install but you can hire a pro to do it. How do pool automation systems work? Back in the "ye olde" days, we had to walk around and flip every switch individually. An automation system lets you control lots of features in one place, and that control panel can be remote from the pool (i.e., closer to you). Pool automation uses a control panel to control certain pool functions remotely through actuators and relays—most commonly the pump and heater, but it can also extend to lights, water features, and spas. Bonus: some extra-modern automation systems connect long-distance via smartphone app or virtual assistant. Some automation systems are pool-specific. Others work for both pools and spas. Sadly, most automation systems are not designed to maintain your water chemistry. They're more for turning things on, off, and to different settings. Setting up an automation system can be tricky, and you should never try to do electrical work if you aren't confident in your skills. Hire a pro and stay safe. How much does pool automation cost? You know what's wild? 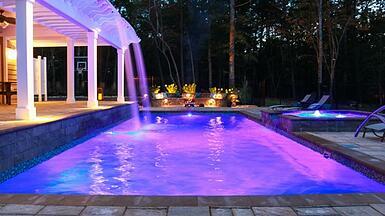 Pool automation is actually less expensive than a lot of other fancy pool features and accessories. A pool automation system can cost anywhere from $1,500 to $3,500. Of course it's more expensive upfront to get one than not to. Long-term, though, an automation system could save you up to 70% in energy costs. That's pretty cool! Can I upgrade my pool with automation later? Actually, if you're trying to save money on the initial purchase, we recommend you hold off on the automation system for a little while. Unlike waterline tile or in-pool lights, this cool feature can wait until a later date. So it may be better for your budget if you postpone getting an automation system in favor of getting those installation-time add-ons that you love. Should I get an automated system for my pool? Pool automation systems are a good fit for tech-y, gadget-y people. The system has the best impact when you have a complex filter system, a lot of special features, and/or pool equipment that's a long way away from your house. They might not be a good fit if you have a pretty basic pool and don't like to get all up in fancy technology. Basically, it comes down to this: Will a pool automation system make your life easier? If the answer is yes, go for it. Want more help accessorizing your dream pool? Do you have any other questions about the process of buying the perfect fiberglass pool? Dive into our ebook, which includes all the details you’ll need to make the best decision for you and your family! At River Pools we manufacture and install fiberglass pools in Virginia and southern Maryland. We also have dealers across the States—and more pool builders join us every week! If you're interested in your own fiberglass pool, get in touch with us. We’ll be happy to help you on your pool journey!